← Cormorants Dining on Trout? 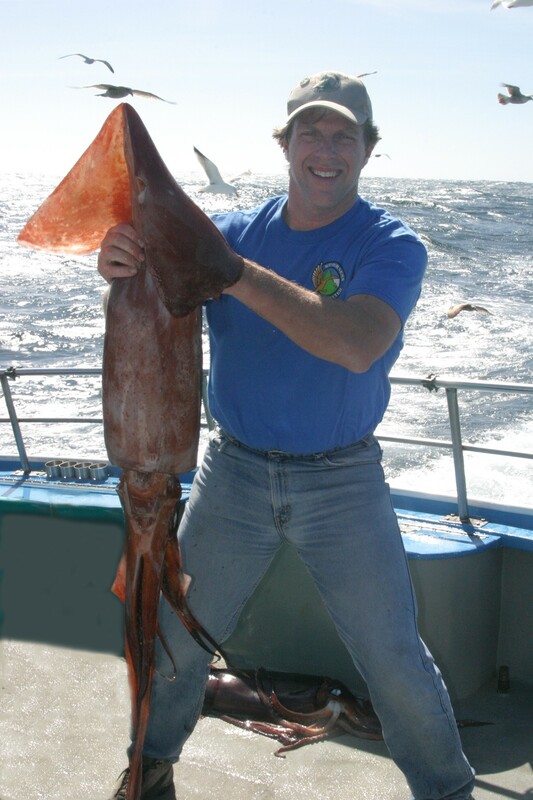 Answer: Humboldt, or jumbo squid (Dosidicus gigas) have indeed made their return to California waters, and in a big way. They are now being caught on party boats from San Diego to Fort Bragg. Special evening trips that specifically target the squid are catching behemoths ranging from 12 to 40 lbs. As far as what impact the Humboldt squid may be having on other game fish populations, the jury is still out. The squid’s major prey items include lantern fishes; however, lantern fishes are prey to a lot of other game fishes, so it may be more of a competition aspect rather than strictly a predator-prey aspect. Humboldt squid are more efficient predators in low oxygen environments than fish predators and can out-compete these species. However, they also feed on a wide range of species from northern anchovy, Pacific sardine, Pacific mackerel, juvenile rockfishes, and squid species (including themselves, hence their reputation) so there is great potential to directly affect game fish populations. For everyone who gets the fun opportunity to fish for these enormous mollusks, take only what you plan to use. One large jumbo squid can easily feed an entire family for quite a long time. By being thoughtful and helping to conserve the state’s marine resources, we hope these animals will keep coming back in good numbers for years to come. If you catch a jumbo squid and do not plan on eating it, please release it back into the water. These monster-sized creatures are a lot of fun to catch and they will usually survive when released, to be caught by another angler on another day. Is It Legal to Carry but Not Use Lead Bullets When Hunting Big Game? Answer: Wild pig are classified as big game. According to Game Warden Todd Tognazzini it is unlawful to possess lead bullets for your handgun while hunting big game. Lead free bullets are available for your .44 magnum and would be required. Fishing trip through Oregon and California and then retaining fish from both? Answer: So let’s say you took one steelhead from the Chetco River in Oregon and then stop off at the Smith River to fish. According to Lt. Dennis McKiver, since the bag and possession limit for the Smith River is one steelhead, you cannot then fish for steelhead in the Smith River while in possession of one steelhead. If you took another steelhead you would be over the possession limit. You will also have to complete and submit a “Declaration of Entry Form” when bringing fish and game in from another state. Having the steelhead recorded on an Oregon Report Card will not be enough. The declaration forms can be found online at www.dfg.ca.gov/enforcement/docs/declaration_form.pdf. Is It Legal to Hunt Rabbits With a Spot Light? This entry was posted in Bag Limits/ Possession, Disposal, Firearms/Ammunition, Fishing, Methods Of Take, Regulations and tagged ammunition, fishing, nongame mammals. Bookmark the permalink.